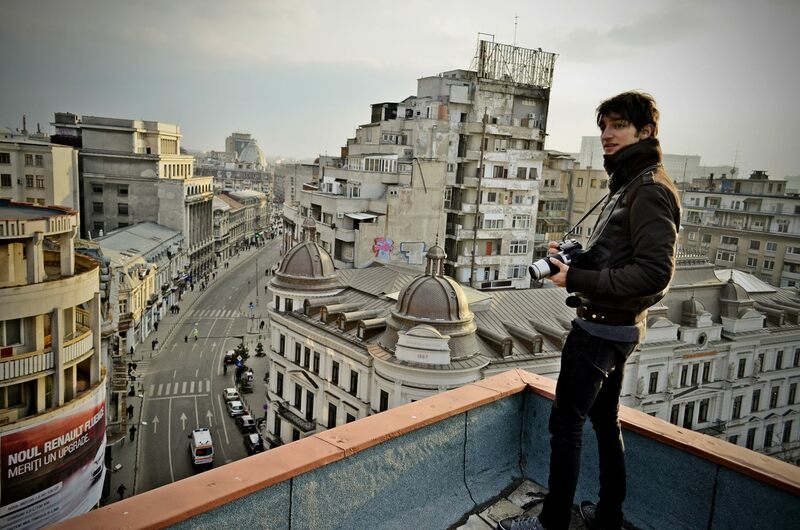 A journalism student passionate about photography and traveling, 22-year-old Alex Iacob is the creator of a blog about urban exploration in his hometown of Bucharest, Romania. Alex explores overlooked or forgotten urban spaces such as old bourgeois residencies, factories and monuments, all left to decay in the communist and post-communist eras. Because his explorations are sometimes illegal, the blog takes its name after Alex’s alter ego, Reptilianul, which protects his identity. Alex started his urban explorations in 2009, when he was still in high school, and has been hooked ever since. He and his friends started finding and entering old abandoned buildings and climbing rooftops from which they could admire and photograph the city. These first collective adventures launched their ongoing quest to find more interesting and story-filled places. As his number of photographs grew, Alex decided to create a blog to share with others. He was surprised and motivated by positive responses to the blog, especially from architecture students, architects and young people with a passion for history or urban exploring. Over the past five years, he has managed to compile a comprehensive archive of Bucharest’s abandoned buildings by photographing and documenting thee histories of the explored spaces. Reptilianul is more than a collection of photographs. It tells the story of Bucharest’s past glory and captures its contemporary beauty of decay and oblivion. Alex’s blog represents the determination to discover new city layers and to invent new ways of representing them. It is Alex’s way of reclaiming and beautifying the city, which has been traumatized by both the megalomaniac vision of former dictator Nicolae Ceausescu and the current collusion of real estate agents and local authorities. Alex explores as often as he can. During his summer breaks, he goes almost daily to old buildings, factories or unknown tunnels hidden beneath the city. He explores less frequently when university is in session. Sometimes he finds his locations randomly, just by walking in the city. Other times, he first finds them on the Internet. Alex prefers exploring Bucharest with friends, not only because it is advisable never to go alone, but also because it is more enjoyable to adventure with other people. For Alex, Bucharest has come to be both aesthetically beautiful and ugly. He confessed, “The higher I am from the ground and the traffic, the cleaner and less imperfect the city becomes. For me, Bucharest is currently like an architectural salad, with its evolution depending on whether or not its inhabitants choose to identify themselves as its responsible citizens.” Alex rejoices at the fact that some houses in Bucharest’s old city center are starting to be restored, but is worried by the architectural mismatch of new and legally-questionable buildings constructed in historical areas. Alex and his explorer friends have been fortunate enough to avoid significant problems during their urban adventures. The police has generally been understanding, allowing them to take the photos. However, Alex stresses that you can never fully count on people’s goodwill, as there is always the risk that authorities could catch you trespassing. There is also a certain amount of danger in entering an unstable and decaying building. In terms of accomplishments, Alex admits that he is just beginning to become aware of them. 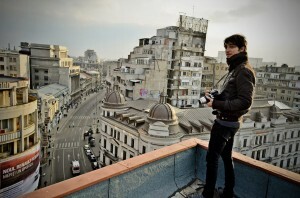 He has held several workshops on urban exploring, including one exhibition close to Geneva, Switzerland, where he represented Bucharest and numerous features in the press. Another great accomplishment will come to fruition in February 2014, when Alex will be premiering his first documentary film, ‘Engelthal-The Angel’s Valley,’ in Bucharest. He shot the documentary with two friends, Ioan-George Pancencu and Robert Casmirovici, in December 2013 and January 2014. The documentary presents the story of Engelthal, an abandoned and isolated Transylvanian Saxon village in Sibiu county, in which an artist has been granted permission to restore the Saxon Church. Alex and his friends raised the funds needed for the documentary through crowd-funding and used it for travel, accommodation and equipment costs. Can physical therapy be fun and fast? Romanian entrepreneur Cosmin Mihaiu proves it can!